Join us and learn the decoupage process from an expert! 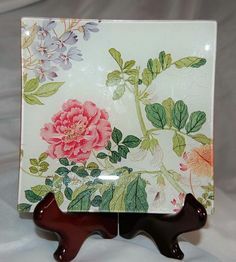 In this hands-on class, we will decoupage a 10 inch springtime serving plate using a variety of floral and spring-themed designs. (*Samples of 2 of the designs are displayed at the Welcome Desk at Cook Park Library, as well as at the Reference Desk at Aspen Drive Library). The plate is food safe and dishwasher safe. All materials will be included. Great for beginners or advanced artisans. Instructor and artist Randy Skepnek will guide participants with step-by-step instructions. A non-refundable $15 materials fee (cash or check) is due to the instructor the day of class (Make checks payable to Randy Skepnek).